ThirtyFifty has a regular diary of wine tasting events that you can attend in Sheffield at the city's finest gastro pub, The Milestone. Both our Introductory Evenings and Discovery Wine Tastings are educational yet fun and pitched at a level so that everyone will learn something new. We can host any of our wine tasting events for private groups or corporate wine tastings at various venues in Sheffield. We have a minimum charge for 10 people for all group bookings. Wine Tasting Experiences make a perfect gift. Our forthcoming dates are listed below or you can purchase an open dated gift voucher so that a date can be booked after your gift has been received. We'll email you a link to the gift voucher to print off at home. If you prefer, we have pre-printed gift vouchers that we can post to you or your gift recipient for £2 (select at the checkout). If you wish to book a specific date simply select the date for the event from the list below. The open-dated vouchers can also be used at other locations including London, Liverpool, Leicester, Manchester, Bristol, Cardiff & Norwich and are valid for 24 months. 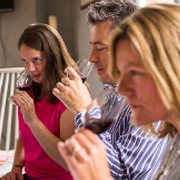 Our evening Sheffield wine tastings are both refreshing and fun, but also easy for budding wine enthusiasts to get a solid grounding that will help navigate the world of wine with confidence. In addition to tasting some delicious wines there are platters of antipasti to share. Not found what you are looking for? Register your interest in attending a wine tasting event in Sheffield by completing the form below. If you have any questions please call us on 020 8288 0314 or contact us by email. Use our online booking system to redeem your voucher. Any queries call 020 8288 0314 or email us quoting your Voucher Code.